Select from Warmers, Cruise-Assist and more! 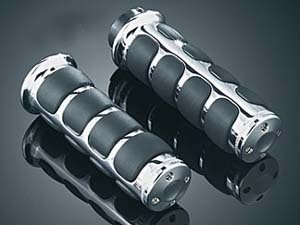 Braided Grips: Get the custom look that works with Braided Grips. 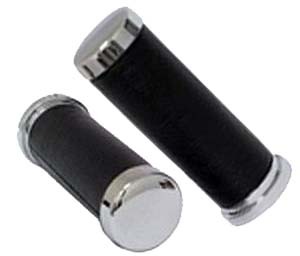 Grips are made from a soft synthetic rubber that provide exceptional comfort that’s made to last. 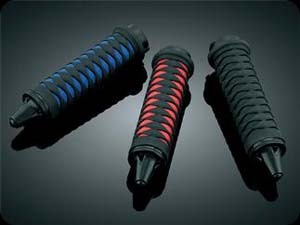 The Braided Grips are available in three color combinations & are designed to work with all four-screw grip accessories that fit ISO grips. 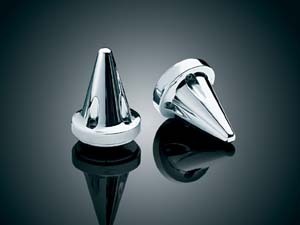 KEM-01: A custom and distinctive look with beneficail funtionality. Black powder-coat. 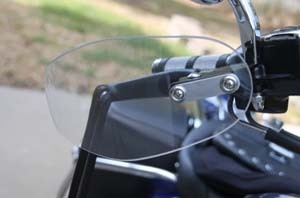 Designed to provide protection from debris and the elements on all '82 to '06 H-D touring models. Sold in pairs. 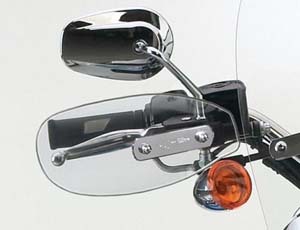 NAT-01: Deflectors are secured to the control boss of y our mirrors, allowing plenty of room for brake and clutch lever access. 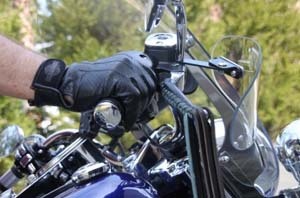 Hand Deflectors are an easy-to-install solution for keeping your hands warmer adn dryer when riding in cold or wet weather. BRU-HDF: Tired of rocks stinging you in the hands when you're traveling on your bike? How about tiny bits of broken asphalt or bugs? Hands freezing on your commute from the windchill factor? And your gloves just aren't doing the job for you... Made of Lexan® polycarbonate - the BRU-WDFs are virtually unbreakable! Lexan® is one of the toughest transparent materials available ~ about 300 times stronger than single-strength glass! Lexan® is also weather-resistant and light weight! So, that translates into a lightweight, transparent, virtually unbreakable protection for your hands while traveling on your motorcycle! 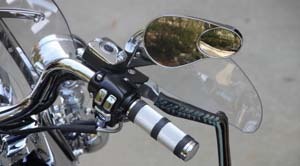 While shaped to curve over your hand grips on your bike, WingShields™ are approximately 5" at their widest point and 12" in length. The shape and curve takes advantage of the wind flow past your hands. 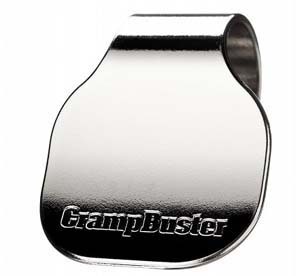 They attach to your bike quickly and easily where the mirrors are installed and the hardware is made of Stainless Steel and aluminum. 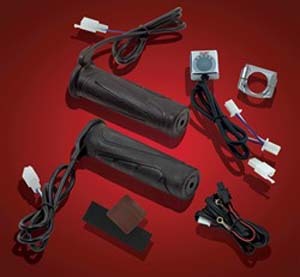 HG-963: Heated Grips for the Electronic Throttle Harley models. Made from extremely durable TPR rubber to not only grip easily but maximize heat to your fingers. Standard room temperature operationis a whopping 170°F which provides extremely comfortable heat when riding in the cold. 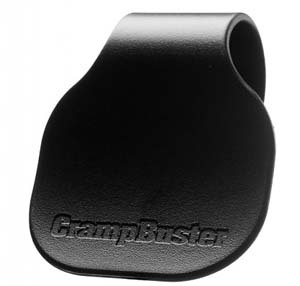 Multiple textures and patterns in the rubber provide a comfortable grip and soothing style. The all new E-Z™ temperature controller is the easiest to use andprovides the most functionality available. Single button control provides 5 pre-set heat settings with each touch of the button reducing 1 level until off. New smart logic design allows the activation of an optional battery saver mode which willshut the grips to off if the battery voltage falls below 12.5 volts. 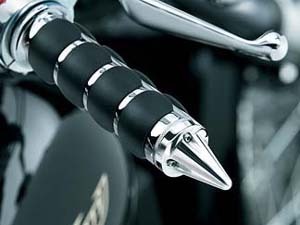 Fits Harley with Electronic Throttle, 1" x 5 1/8" Bars. 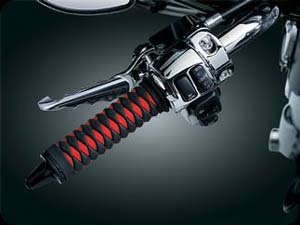 Heated Grips: Ride comfortably year-round with Heat Demon Grip Warmers for Harley. With four settings & L.E.D. heat indicator lights, you can set your ideal temperature on cold riding days. 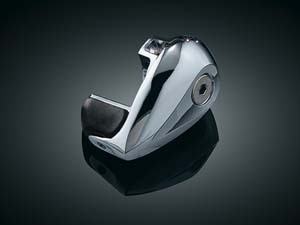 The sleek controller mounts to the left side clutch perch & features one-button control for easy, safe heat adjustment. Kit includes everything you need for a convenient, clean install. 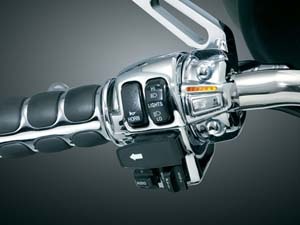 6327, 6326: Fits: All ’82 - current H-D Models with 1” Handlebars including Touring Models with Electronic Throttle (except models with air reservoir in handlebars) Controller Mounts to Left/Clutch Perch. 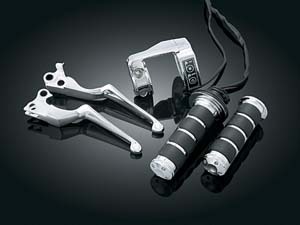 ISO Grips: For the rider who demands the ultimate in comfort and style, eGlideGoodies offers the ISO-Grip. Styled to match the popular ISO-Pegs, they dampen handlebar vibration while providing a sure cushioned feel for long haul comfort. 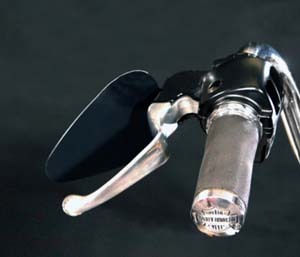 Because of their unique removable end caps, this is one of the only custom grips available that may be used with stock air reservoir type handlebars. 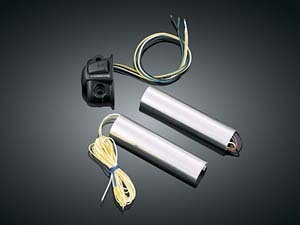 Available with or without Throttle Boss and with dual cable or electronic throttle. 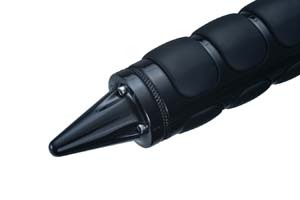 The ISO Throttle Boss can be added to the popular ISO-Grips. The Throttle Boss can make all the difference in the world on a long ride. 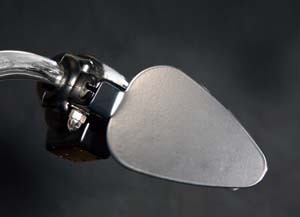 A small adjustable paddle that is positioned under the palm of one's throttle hand. 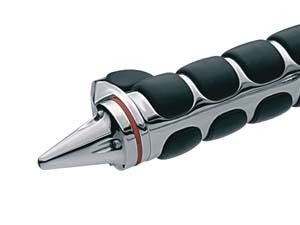 This allows the driver to slightly relax the grip on the gas and still maintain a constant speed. Muscle stiffness and fatigue are reduced after prolonged cruising at a steady pace. Fits all ISO-Grips. A new redesigned rubber pad permits use on both grips for a matched set. 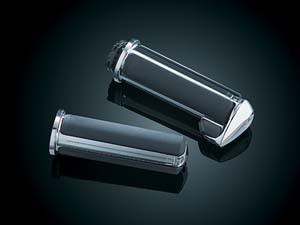 Stiletto End-Caps simply replaces the existing end cap on ISO Grips. Installation is very easy. 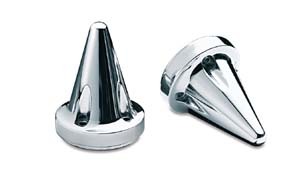 Screws supplied for use with or without ISO Throttle Boss. 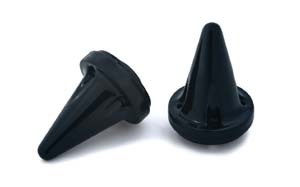 Add the KewLock to your ISO Grips and have a convenient and safe place to put your helmet when you leave your bike. 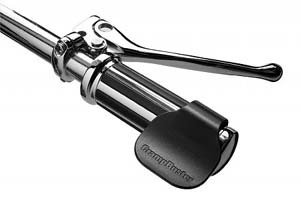 This trick little device adds both a locking helmet holder to the end of your grips as well as functions as a bar end weight to assist in stabilizing. 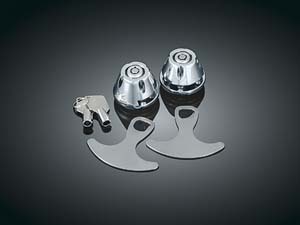 Simply slide your helmet D Ring into the slot or use the provided helmet lock extension and lock it in. Fits: ISO Grips. Pilot Grips: Either by themselves or used along with our line of Pilot footpegs, Pilot Grips are a great addition to your scooter. 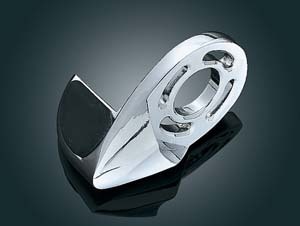 Comfortable raised rubber pads provide a secure grip area, while the chrome body adds a subtle accent to highlight other accessories. For an added measure of comfort, a specially designed Throttle Boss is also available. and control. Grips measure 5" in length. Fits all models with exterior throttle cables (except models with handlebar air reservoir). 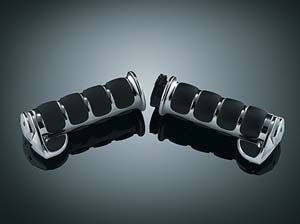 Chrome Rail Grip Set: The latest lok in custom handlebar grips. 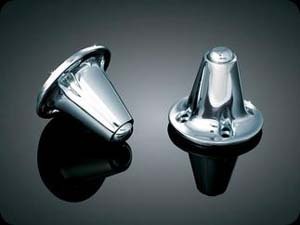 Chrome plasted die cat aluminum with rubber rails protruding through lengthwise slots. Provides great look and a positive non-slip feel. Fits all models with exterior throttle cables (except models with handlebar air reservoir). 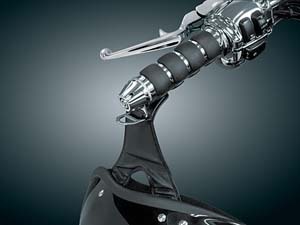 Cruist Assists: Let the weight of your hand do the work!Dramatically reduces wrist fatigue often caused by long rides. Rotates forward all day long, yet when downward pressure is applied the throttle is regulated effortlessly & accurately without squeezing. 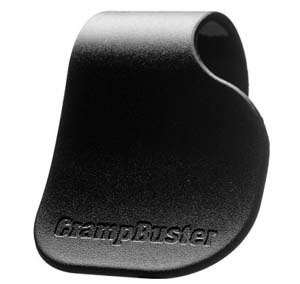 The CRB-1 fits most bikes with standard grips too. 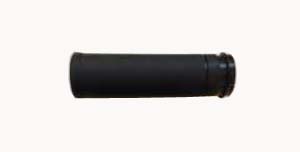 The CRB-1 narrow paddle, fits 1 3/8 or smaller diameter, 1 inch wide by 3 inches long, color: black. The CRB-2 fits most bikes with standard grips, metric bikes too. 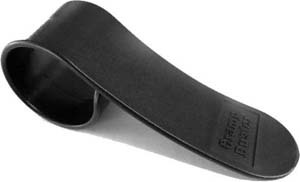 The CB2 wide paddle, fits 1 3/8 or smaller diameter, 1 inch wide by 3 inches long. 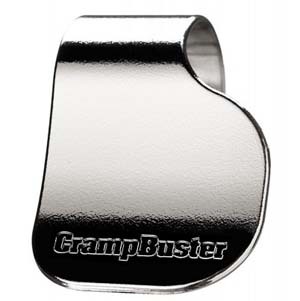 Fits bikes with a larger grip such as Harley and also heated grips. 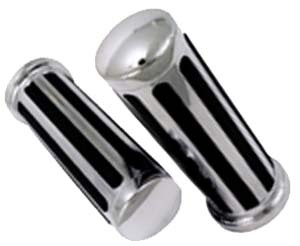 Black or chrome over plastic. The CB4 wide paddle, fits 1 3/8 or larger diameter, 2 inches wide by 2 3/4 long, color: black or chrome finish on plastic. Unable to find what you need? Contact us at: info@eglidegoodies.com We have early & late model grips not listed above.